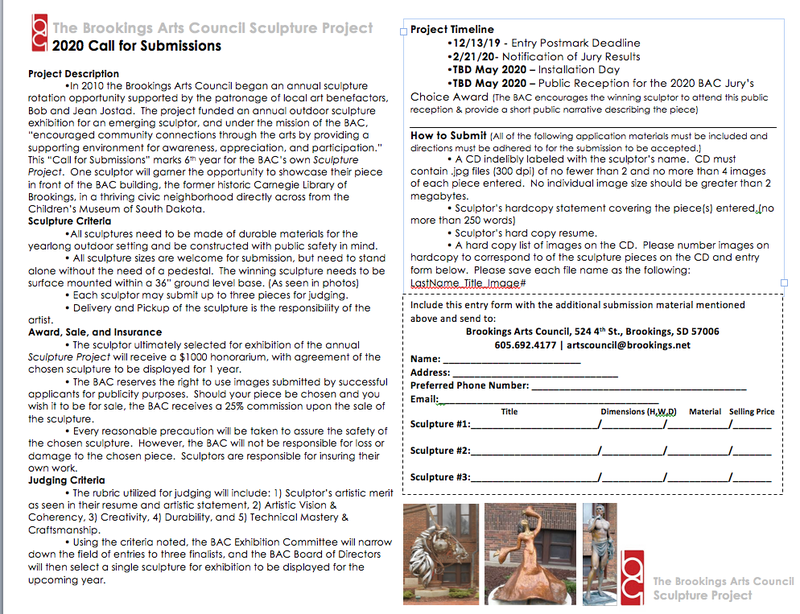 The BAC also provides a platform for the community's youngest artists by partnering with area schools to sponsor exhibits of work by students from kindergarten through high school, Emerging artists; teens through senior adults find a home to enhance their artistic skills at the Brookings Arts Council. From the Art Factory; all ability artists, to creARTive; the statewide high school art competition and exhibit, to bringing in professional artists to conduct workshops, the Brookings Arts Council strives to make art happen for all ages and ability levels. Located in the historical Community Cultural Center building at 524 4th Street just south of the Children’s Museum. Hours are noon to 5:00pm Tuesday through Friday, Saturday 9-noon. The amazing students at SDSU in Cable Hardin\'s Animation class developed our new marketing videos. Keep checking back with us to see the others...as we will change them out periodically! We are so thankful for each teams\' time and incredible talents! !